Grain Free Baking Powder Recipe your paleo and grain free baking. This Grain Free Baking Powder/Paleo Baking Powder post contains affiliate links. If you make a purchase through these link Living Freely Gluten Free makes a small percentage. That helps to pay the bills for running this website, so I can continue to bring you delicious recipes. Thank you for your support. When your ready to transition into a grain free diet, or just want to eat healthier and learn the grain free basics- You will need to have a grain free baking powder on hand if your recipe calls for it. Why do I need a paleo baking powder or grain free baking powder? If you want to transition into a grain free lifestyle you don’t always think about the small things, like a baking powder. Traditional baking powder contains corn starch, therefore is not grain free. My Grain Free All Purpose Flour Blend can almost be used cup for cup in place of my Gluten Free All Purpose Flour Blend. So, creating grain free recipes with it is becoming pretty simple for me. There are a few exceptions to this- for example it did not work with my pizza dough. But, if you have my Cookbook then you can use it perfectly in the Chocolate Chip Cookies, Biscuits, French Bread and hopefully I will experiment with more soon. A lot of paleo recipes try to use just baking soda, but sometimes baking powder is a must to get the results you desire. You can purchase grain free baking powder, but it can be pricey. This Grain Free Baking Powder is also Paleo. I have used this grain free baking powder to make my Grain Free Paleo Pancakes. You will be able to use in some recipes coming to the blog soon like my Paleo Chocolate Banana Brad and Grain Free Chocolate Cake. 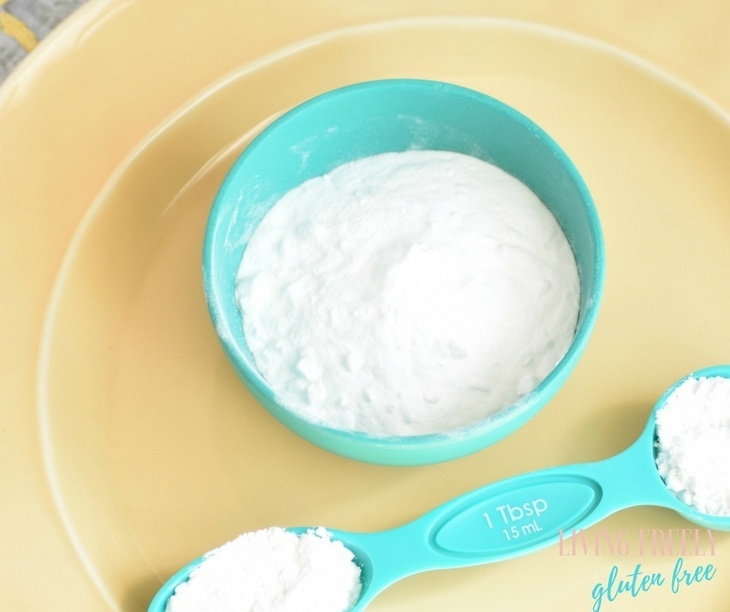 Making your own grain free baking powder is incredibly easy and inexpensive. You simply need Baking Soda and Cream of Tartar . My only complaint about this grain free mix is that it does harden up. Corn starch is in traditional baking powder and that helps to avoid lumping and hardening. You will need to stir this up pretty good before each use. Enjoy! Blend together and store in an air tight container. Double this if you plan to bake a lot. It does clump a bit, so give it a good stir before each use.